The International Woodworking Fair (IWF) is one of the world’s largest trade shows for the furniture manufacturing, architectural woodwork, custom and general woodworking industries. 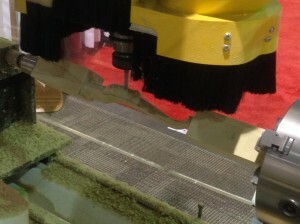 MecSoft in partnership with New CNC, showcased RhinoCAM’s multi-axis machining at IWF in Atlanta, Georgia during August 20 -23 2014. 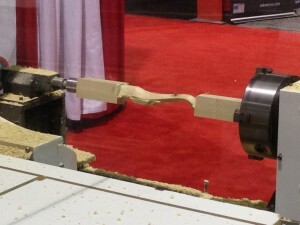 At the show we demonstrated how to program and machine a decorative carved table leg using a 4 axis setup in RhinoCAM. Within minutes the part was programmed in RhinoCAM. Starting out with a 2” x 2” x 20” wood blank, we roughed it from 2 sides (top & bottom) using a 1 ¼” end mill to remove the bulk of the material and bring it close to the finish shape of the part. Then a finishing cut was done using a continuous 4 axis parallel finishing method with a ¼” ball mill. The time to rough the stock blank only took a couple of minutes for each side and the finishing process was under 10 minutes. Attendees at the show noticed how easy it was to CNC program a fairly complex part using RhinoCAM and were amazed to see how easily it was to transfer the programmed code to the machine and have it machine so quickly and with such precision and accuracy on this SMART Series machine built by NEW CNC. 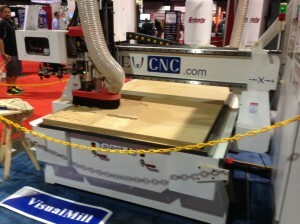 It was just mind blowing for some attendees who were new to this CNC process. They could very well see how this process would help them in their workflow to be able to automate their work, make more parts in a short span of time and improve their productivity. Several of our customers who stopped by at our booth, expressed that RhinoCAM has been a great tool and performed beyond their expectations. Take a look at the pictures from the show. 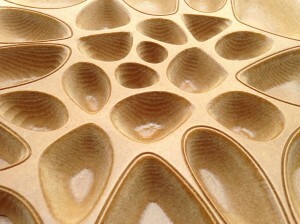 The images feature the progression of the machining on the 4-axis CNC router. Picture 2: After roughing wooden blank. Picture 4: Machining of the part is complete! Here are pictures of some of the 3 axis parts that were programmed and machined on the CNC machining center. Picture 6: Machining of the part is complete! MecSoft would like to thank Tom Galzin of NEW CNC for providing this opportunity to present MecSoft CAM products at the 2014 International Woodworking Fair. It was a very nice experience. 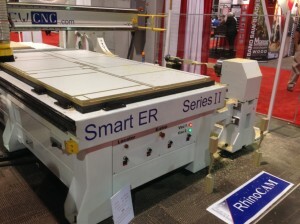 NEW CNC of Holland Michigan builds affordable, industrial quality CNC routers for small and mid-sized shops. Their emphasis is to provide machines that are easy to use, highly productive, and above all extremely dependable. Every machine is backed by their industry leading customer care to insure that each NEW CNC machine is always up to date and in perfect operating condition. 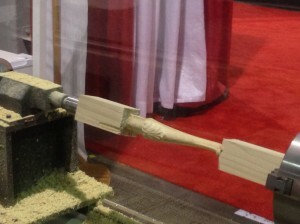 The International Woodworking Fair (IWF) in Atlanta is the trade show where the most top management and qualified buyers go to source their products and find solutions for their business. These professionals come from a broad range of industries related to the cabinetry, architectural wood, home furnishings, business furnishings and related material processing machinery, supply and service industries. These customers are looking for products like CNC machinery, tooling, lumber, finishing, sharpening, laminates, hardware, adhesives, molding, doors, windows, routers, saw blades and accessories and much more. IWF attracts buyers from a broad range of industries looking for the newest, most advanced and cost effective manufacturing technology and supplies available to improve their company’s bottom line. Watch the demonstration live on our YouTube channel. Uday is Technical Support Manager for MecSoft Corporation. He started as an Application Engineer and has been with the company since 2005. He is responsible for providing technical support and training for end users. Uday holds a MS degree in Industrial Engineering from Arizona State University majoring in CAD/CAM.